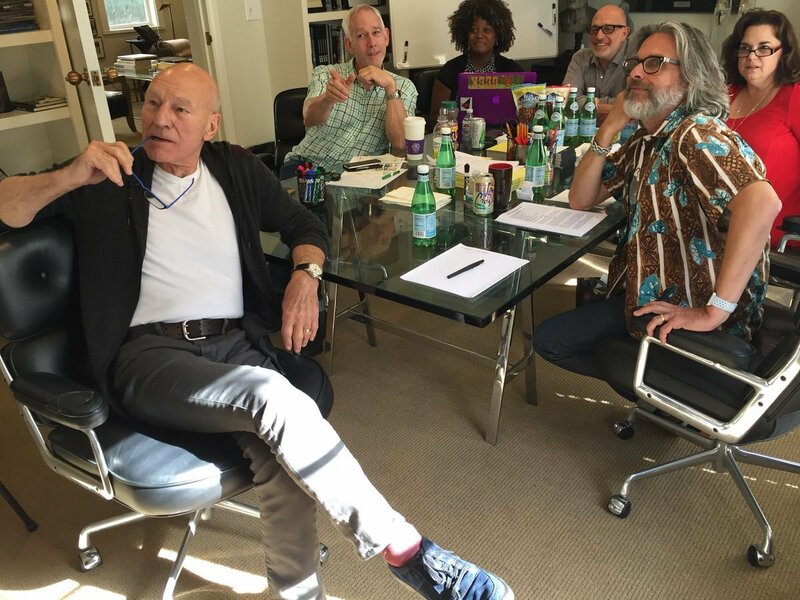 They said it would never happen, but Patrick Stewart’s Jean-Luc Picard is returning to Star Trek, and we’ve got the picture to prove it. Posted by Stewart himself on his Twitter page, the photo seems to mark the first official meeting of the production team at CBS, with Stewart introducing “Kirsten Beyer, Michael Chabon, Akiva Goldsman, Diandra Pendleton-Thompson, James Duff, and yours truly.” Sadly, it doesn’t seem to give any indication of what the series will actually be about, but it’s still exciting nonetheless. That being said, there is a sheet of A4 tantalizingly positioned next to Michael Chabon, but the picture’s too low resolution to see what it says on it (unless anyone can work some Blade Runner style zoom and enhance magic). There’s also a sculpture of what looks like an alien design at the rear of the room, but that’s most likely from a previous production. Given that the whiteboard is empty, it looks as if this is going to be an ideas session for concepts to be used in the show. Presumably, they already have a broad outline of why Picard will be returning, but I’m sure there’s a lot of blanks still to be filled in. What might hint at what’s to come came though is what happened a few weeks back, when nearly all of the cast of Star Trek: The Next Generation got together for a much-photographed meal. With Picard’s return already announced, it seems inconceivable that the actor wouldn’t have discussed the show with his former colleagues, perhaps with an eye to seeing where some of the other members of the USS Enterprise 1701 (NCC-1701-D) have ended up. Hopefully, we’ll have a better indication of what’s to come pretty soon. These are bright times for Star Trek fans, after all, and Picard’s imminent return to TV screens is just the glistening cherry atop a deliciously starship-shaped cake.